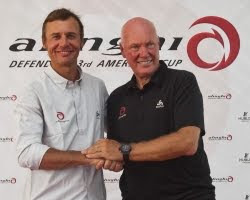 Alinghi, Defender of the 33rd America’s Cup, is proud to announce Hublot, the Swiss luxury watchmaker, as a team sponsor for the 33rd America’s Cup. Alinghi president Ernesto Bertarelli and Hublot CEO Jean-Claude Biver held a joint presentation at the Alinghi base in Genoa, Italy, this afternoon to announce this union of Swiss expertise. The two brands share many common values, be it their constant pursuit of precision and excellence, or their approach to technology – developing it to a maximum for greater performance.